HD Digitech HDX-1000 1TB review | What Hi-Fi? The HD Digitech is supplied by the people at ripcaster.co.uk. It's also the first media player we've used that offers the flexibility and performance to rival a full-on media centre PC. We were confronted with Japanese menus when we first turned the unit on and had to fumble through the settings to switch to English, but we suspect this was a one-off. The HDX-1000 also struggled to find one of our two NAS devices, leaving us to manually enter its network location. Little niggles like this pop up every so often, and although they're unlikely to cause a problem for anyone with a little knowledge of PCs and networks, they still leave it short of the idiot-proof simplicity of an Apple TV. 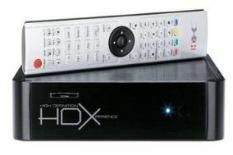 Where the HDX-1000 leaves the Apple TV eating digital dust, however, is in format support. Everything we threw at it was played without fuss, from WAV, FLAC and AAC music to AVI, DIVX and hi-def MKV videos. It'll even play ripped DVDs and Blu-rays, the latter at 1080p/24fps with HD audio intact. The only files it won't play are DRM-protected ones. You can play files directly from a PC or NAS device on your network, or you can transfer them on to the 1TB hard disk (it's also available in 500GB and diskless forms) using the Ethernet or USB connections. In fact, once there's content on the HDX-1000, it can act as a NAS device itself, sharing said content with the rest of the network. It even has its own BitTorrent client for downloading files directly. Performance with video is excellent. Standard-definition material is close to the original, and apart from a touch of motion smear, so is HD. Only the sonic performance is a bit of a letdown. Although there's much detail to surround soundtracks, we found music playback to be rather lacklustre. The only other niggle is the operability of the unit. The bright background is smart, but to access files you're simply navigating your lists of folders, which can be arduous. If you're happy to live with this and the lack of musicality, and you know a bit about computers, only this and the Popcorn Hour A-110 1 TB, also from ripcaster.co.uk, offer true format flexibility.